Our July, 2015 week of mission was again a local project. 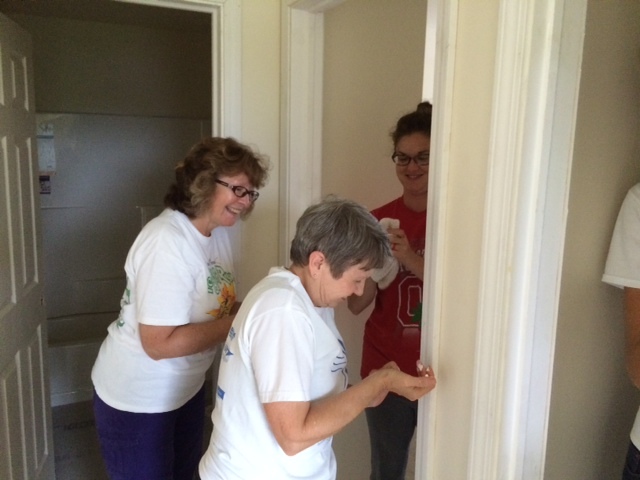 We participated in a Habitat for Humanity new home build in Covington, KY (Latonia Lakes area). Twelve adults and one teen participated in the building project during the 4 days of work, July 8-11. Major accomplishments included laying flooring throughout the house, including ceramic tile in 2 bathrooms. Caulking, painting, installing door trim, door knobs and baseboard, and installing closet shelving and doors were other tasks completed. The fellowship of the days was culminated with evening meals provided by church members, served back at the church. Our cooks included 7 Lakeview UCC saints who provided delicious food for the hungry workers.